Find the courage to live well with Dr. Gordon Livingston, bestselling author of Too Soon Old, Too Late Smart, And Never Stop Dancing and How to Love. 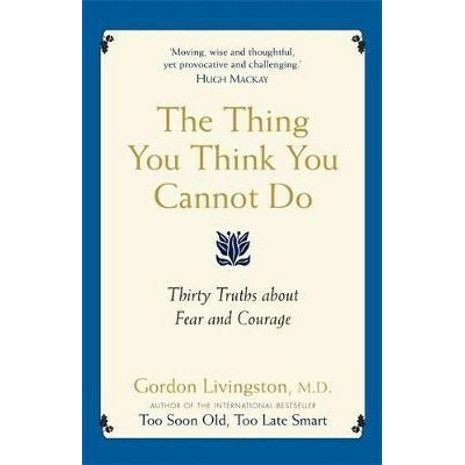 Bestselling author Dr Gordon Livingston MD brings his usual wisdom to the subjects of fear and courage. We live in a time when so many fears: fear of terrorism, war, disease, are all magnified, it seems, by media and the internet. How are we to find the courage to live, and live well despite the constant threat of fear? Dr Livingston identifies fear as the central issue of our time, that has become a corrosive influence in modern life, eroding our ability to think clearly. Overcoming our fears constitutes the biggest struggle in our lives. As a psychiatrist, Livingston knows how reliant many are on pharmaceutical remedies to alleviate anxiety. While these may be effective, he has recently found himself increasingly prescribing human virtues like courage, which is integral to his thirty individual truths which are explored as the tools to overcome our fears on every level, in order to free up our lives. Gordon Livingston M.D. has been a physician since 1967. He is a psychiatrist and writer and contributes regularly to the US press. He is the author of the internationally bestselling self-help and inspirational books Too Soon Old, Too Late Smart, And Never Stop Dancing, Only Spring and How to Love. He lives in Columbia, Maryland.